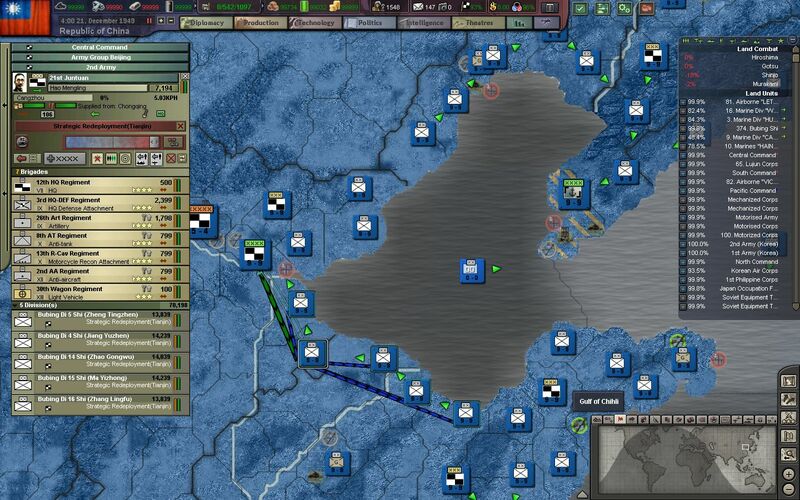 Hey all, and thanks for reading the final episode, Episode 22, of my Republic of China AAR in BlackICE 8.6. If you missed the previous episodes, they are linked below. 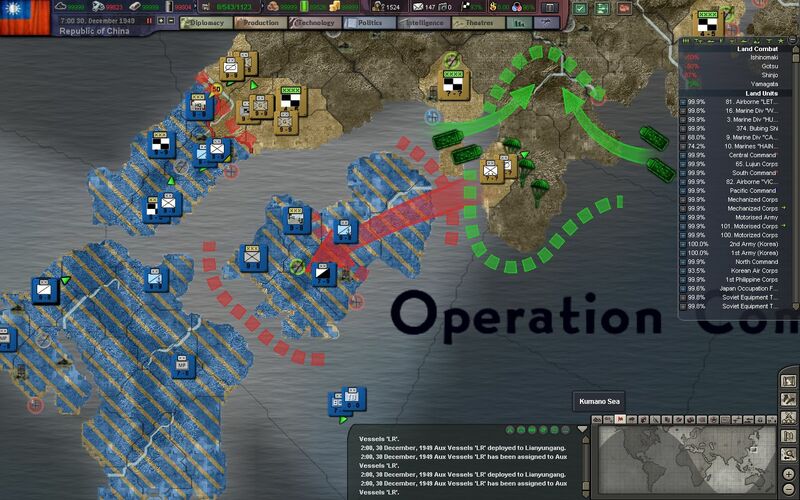 Previously, our invasion of Japan, codenamed Operation Warhammer, proceeded with Operation Flood and Operation Monsoon, a grand, combined-arms operation that captured the southern islands of Kyushu and Shikoku, but unfortunately failed to destroy much of Japan's remaining regular military units. 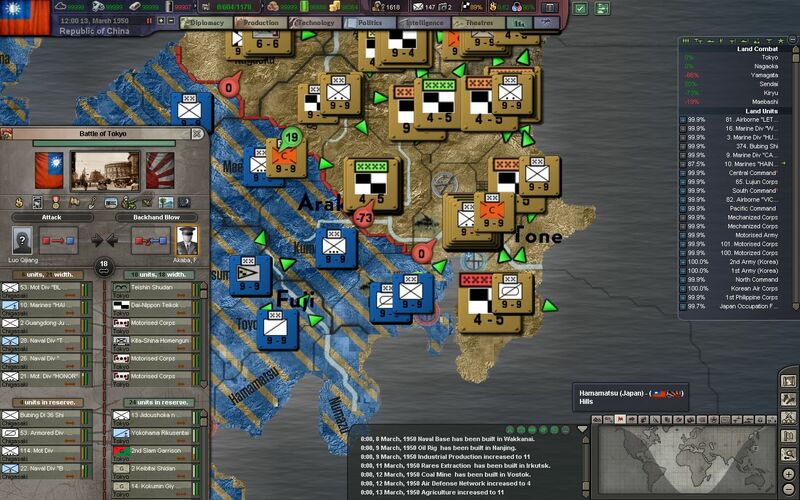 An armored army of 200,000 Japanese veterans stands across from Shikoku, blocking our advance into the southern plains of Honshu, and hordes of militia and conscripts hold back our mountain troops in the North. Our only real foothold is around Hiroshima, on the western tip of Honshu. Coastal guard units from across the eastern seaboard of China are pulled into ports and prepared for transport to Kyushu. 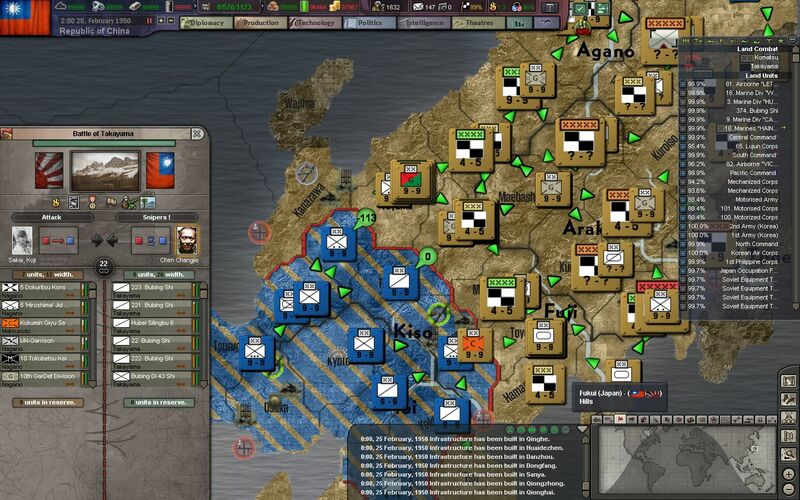 Nearly 500,000 more regular infantry will be needed to hold the lines around Japan, in order to free our more elite troops up for mobile operations. 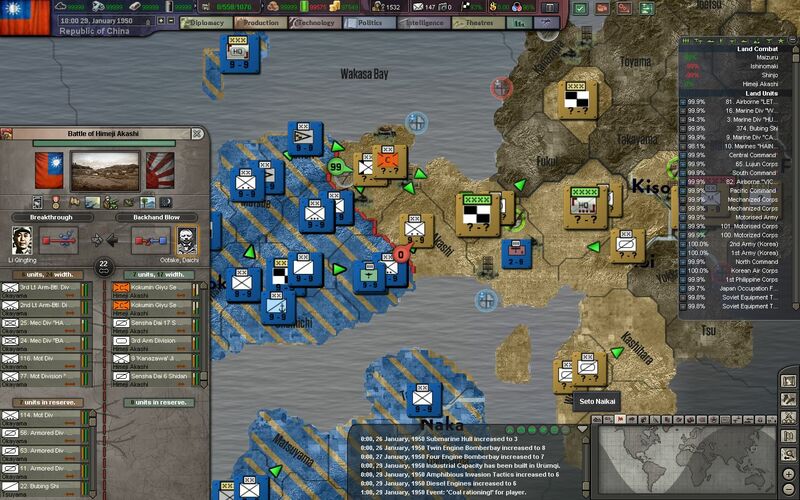 High command draws up the risky Operation Comet, which aims to lure the Japanese armored army into Shikoku, where they will then be systematically destroyed by our shock divisions and air troops, while our navy blocks their retreat back into Honshu. 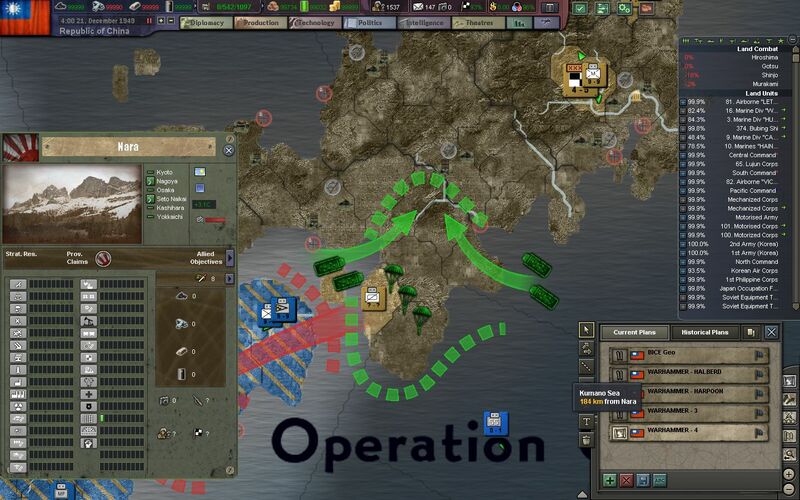 Paratroopers and marines will be landed and will focus on defending the small peninsula at the mountains at Nara. 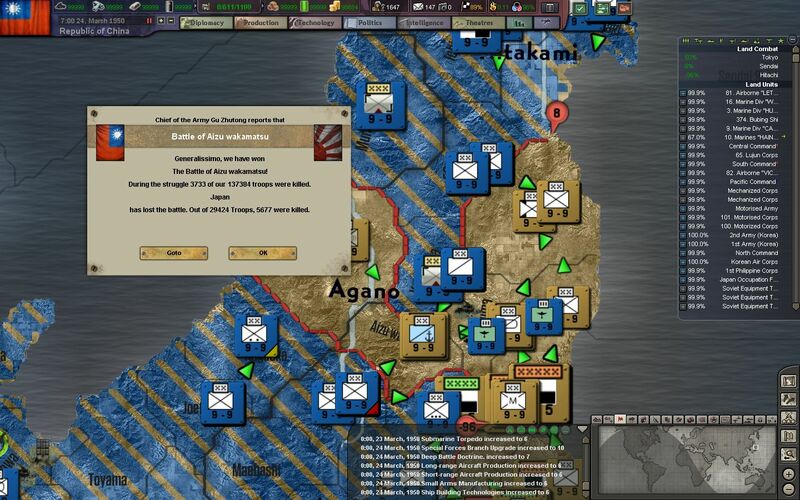 Some pressure in northern Honshu is relieved as the militia calls off their reckless attack on Shingo. 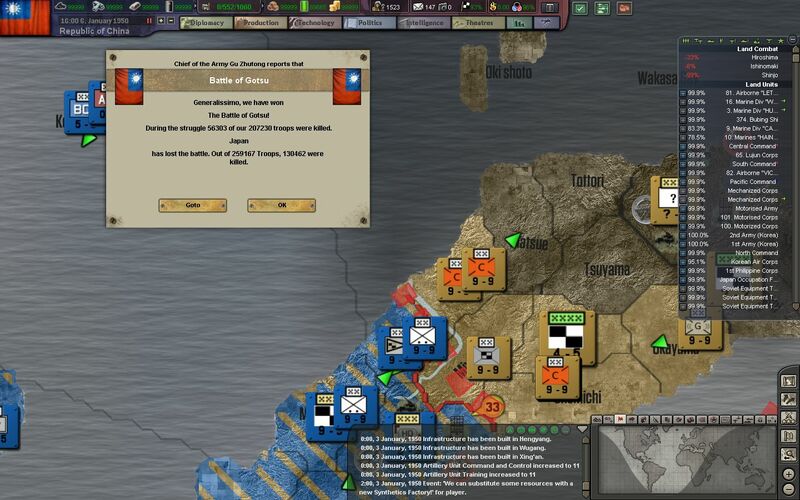 Their casualties are beyond belief, but unfortunately it has also resulted in many of our forces being held back in order to contain these assaults. 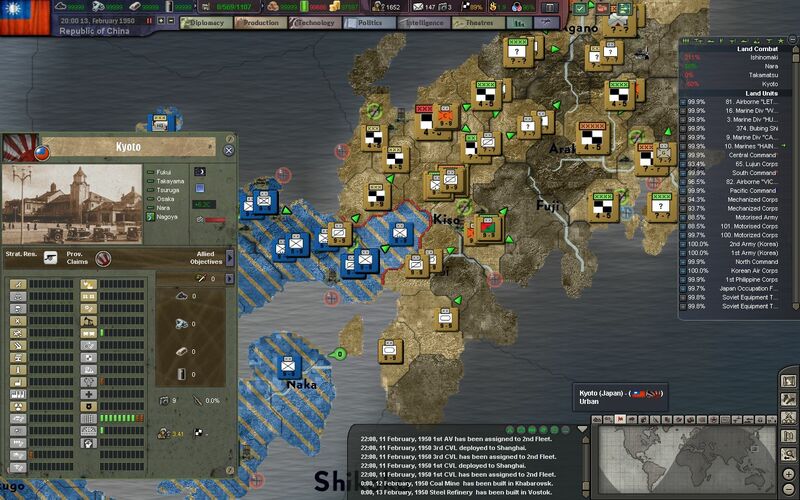 Another counterattack on Hiroshima is beaten back by our marines currently garrisoning the city. 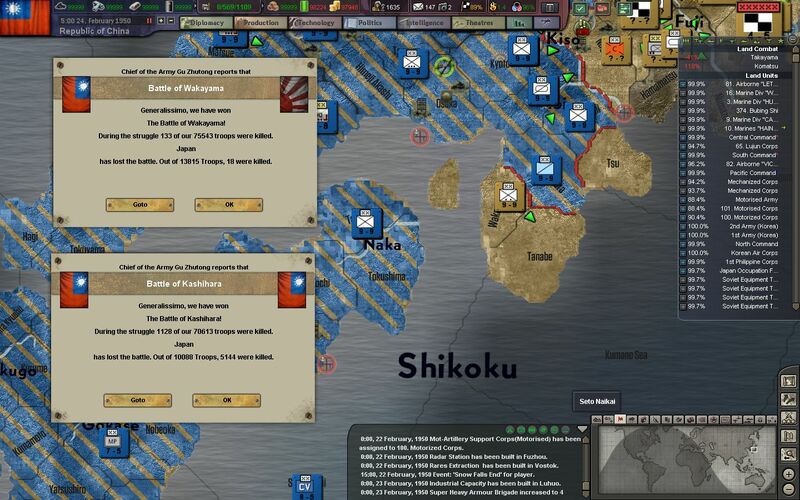 As we push deeper and deeper into Japan, our casualty rates climb higher than even our most pessimistic generals had predicted. 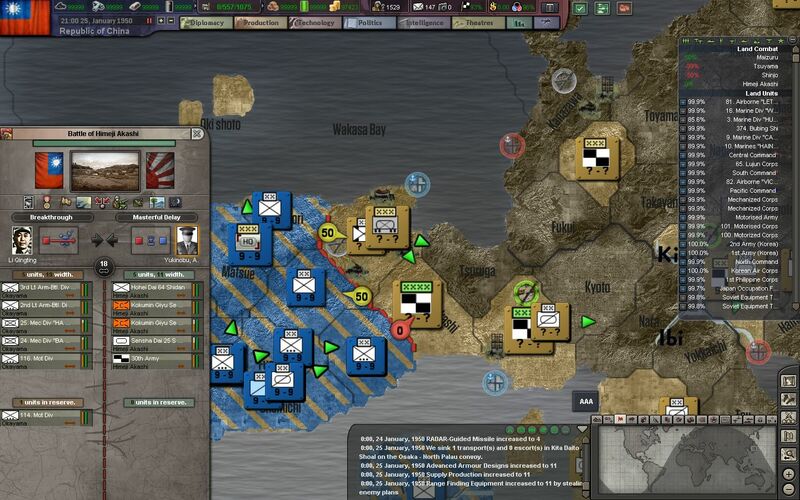 The reinforcements from our coastal guard will be crucial if we are to push out of these exposed positions. 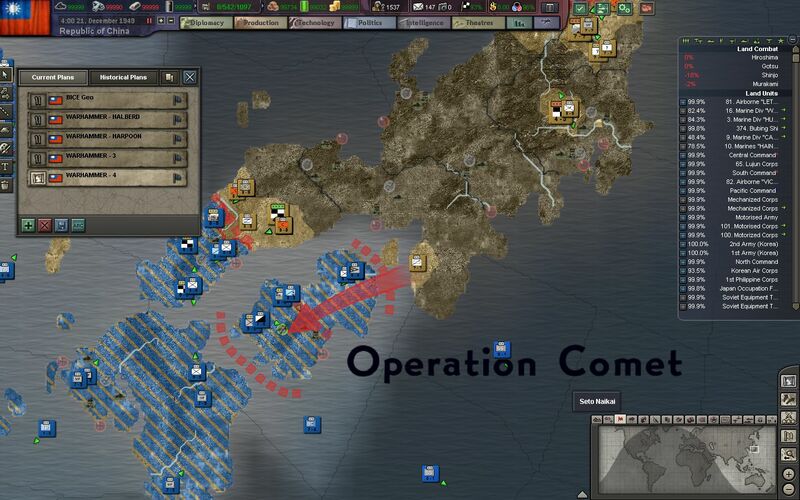 It seems the Japanese armored army is not taking the bait of Operation Comet, and are content to sit back across the strait from Shikoku. While this is a major disappointment for our generals, this also presents an opportunity. 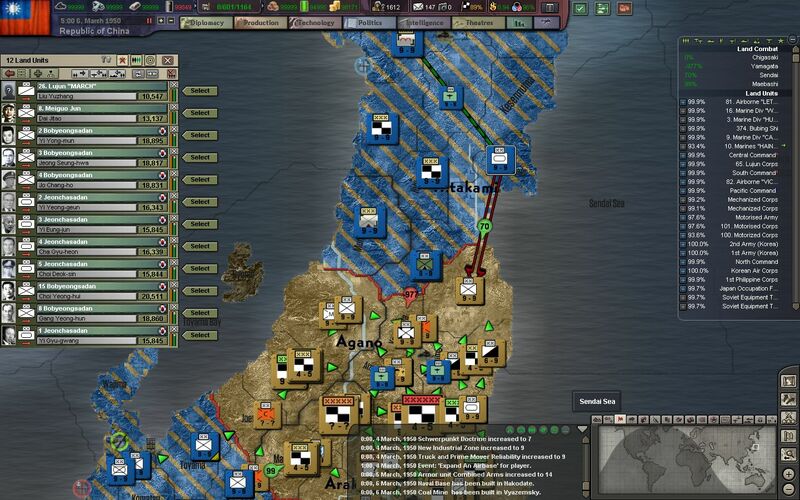 With most of Japan's elite forces obligated to defend this crossing, their lines held elsewhere by poorly-trained militia and conscripts are vulnerable to a breakthrough. Our attempts to break through in the north are repulsed again. The mountainous terrain prevents us from using our air and armor superiority, and in the narrow mountain passes, valleys, and crossings, even armed citizenry pose a significant threats for our fierce shock troopers. The 3, 4, 5, Shock Divisions, as well as the elite 200. 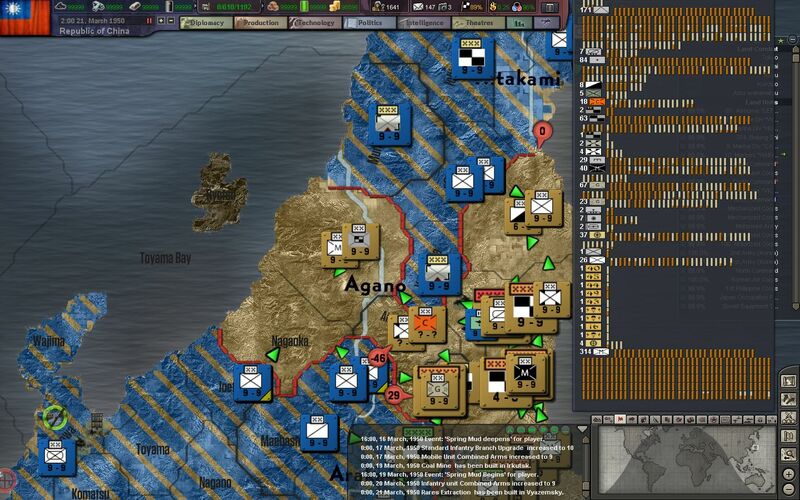 Armored Division rush across the gap into Izumo. 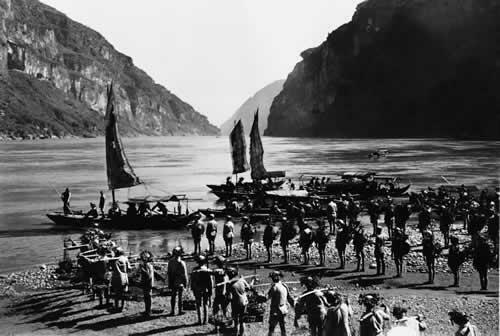 24 Hours later they secure the river crossing and force the conscripts from their positions. This new spark of hope is contagious among our troops. The path to Tokyo is wide open - as long as we are fast and ferocious enough. 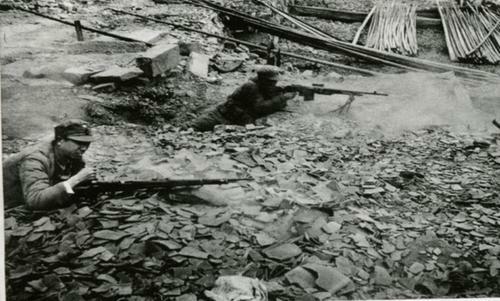 Our marines break out of Hiroshima a few days later, shattering the defensive lines east of Hiroshima, at Onomichi. 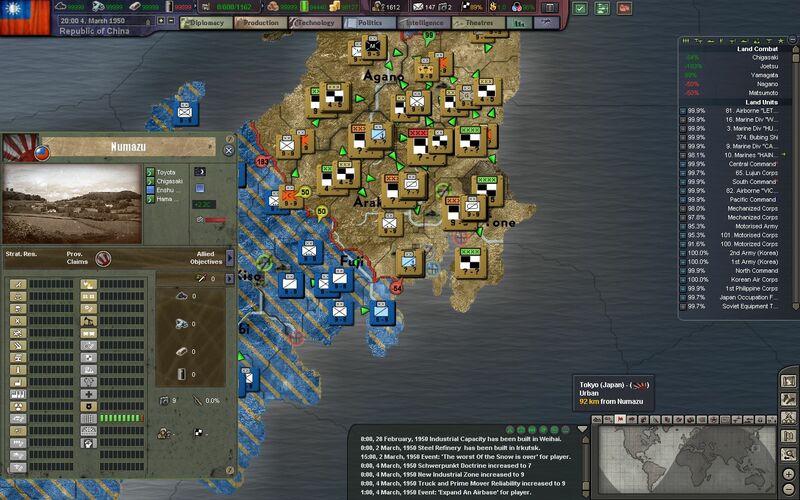 The conscripts manning the front lines in the western tip of Honshu are quickly collapsing. 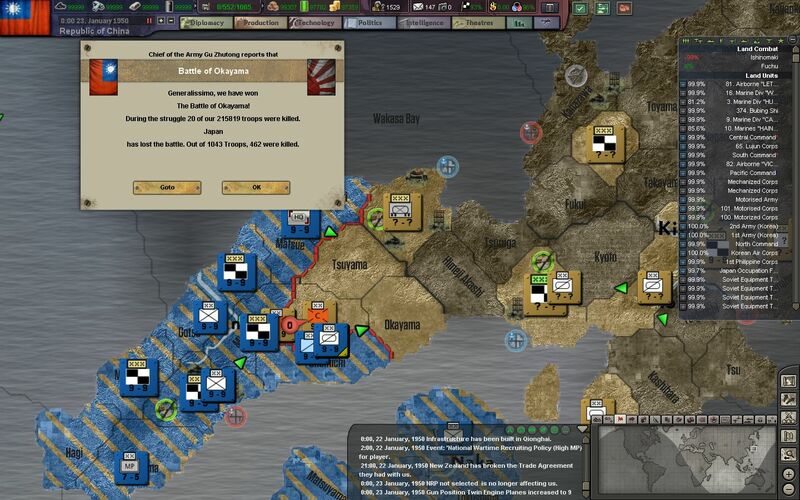 The 200th Division, as well as 3 Shock Divisions secure the river crossing, and now dig in to hold back counterattacks as more regular infantry pour in from the South. 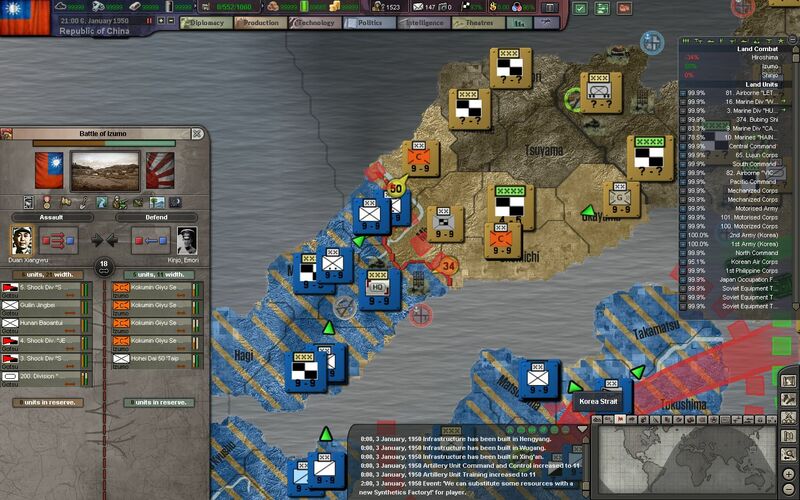 Our former coastal guard units will be instrumental in holding parts of the line, so that our Shock divisions have the operational room to mount more attacks. 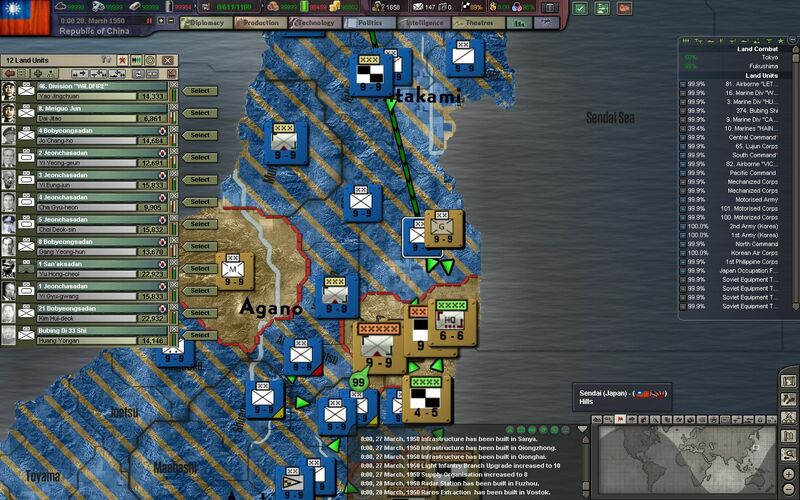 More conscripts and militia are decimated at Tsuyama and Okayama. 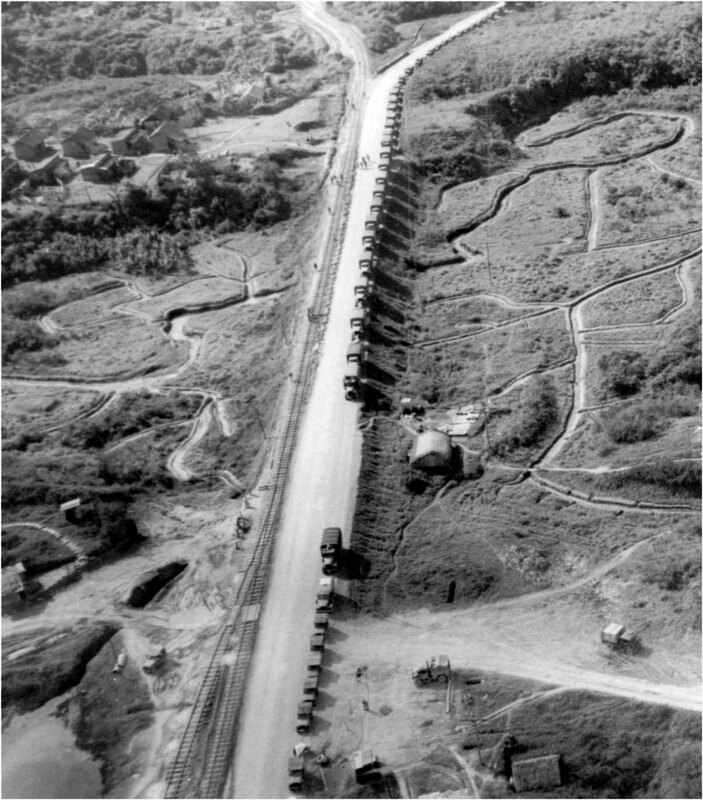 Motorized and mechanized units pour through the gaps, hoping to constantly keep the Japanese on the run. The 3. 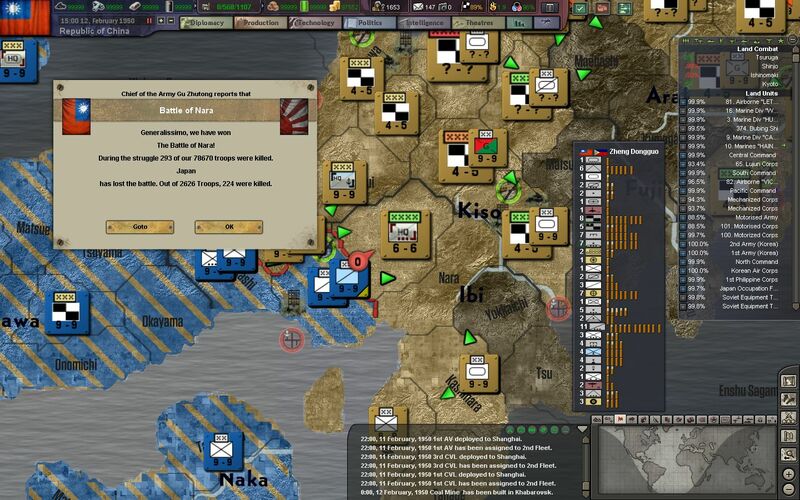 Shock Division mounts an attack on the port of Maizuru, which is currently only manned by command units and a small garrison. 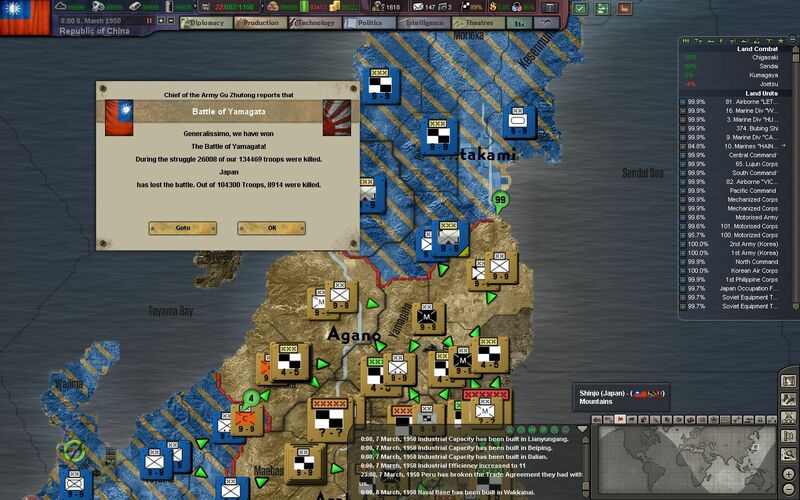 As we approach the two major cities of Osaka and Kyoto from the West, we begin to see more and more Japanese armor and elite infantry, which threaten to stop our advance in its tracks. 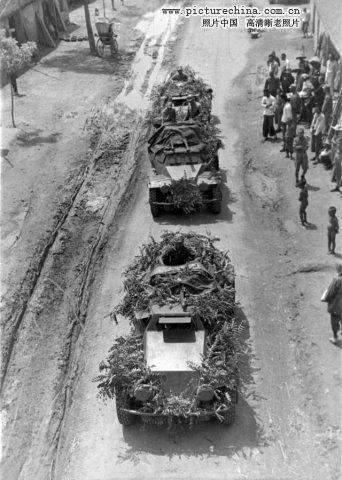 Our motorized and mechanized divisions must keep up their quick pace if we are to prevent another deadly stalemate. 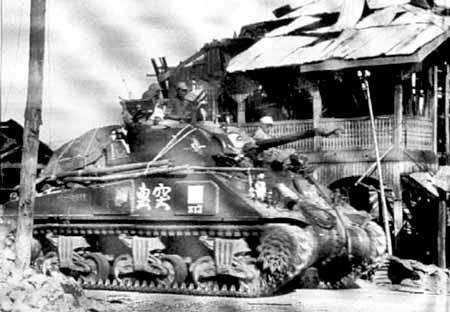 More Japanese tanks pour into the isthmus of Himeji Akashi, and we respond with armor of our own. 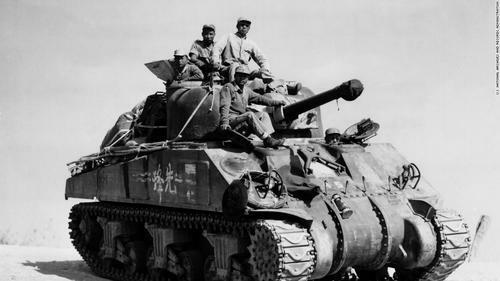 Chinese built M4s duel with Japanese medium and light armor in the plains west of Osaka. 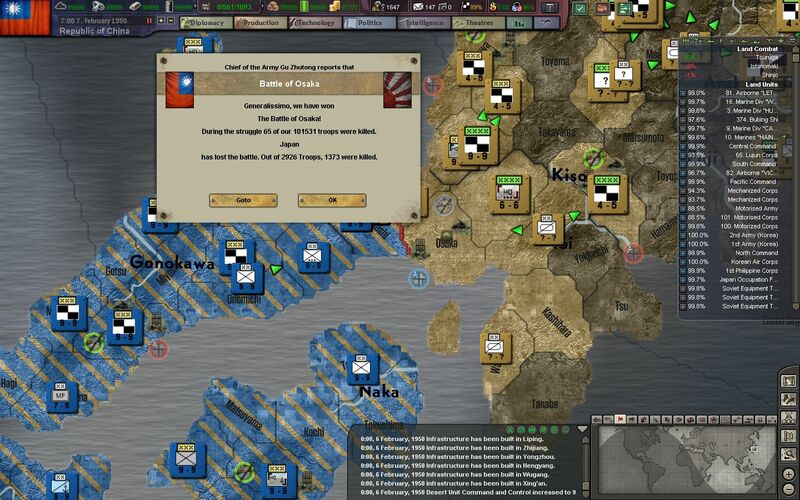 Our crewmen sustain heavy losses, but inflict irreplaceable ones on the Japanese. 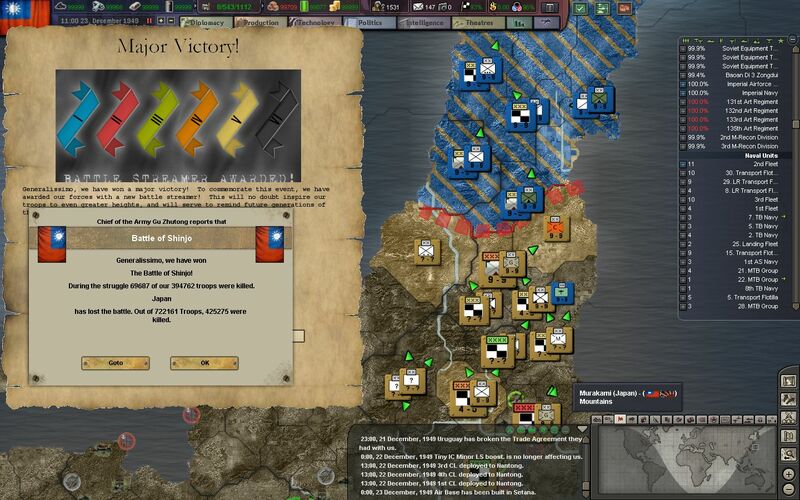 They are quickly running out of the iron, fuel, and men to maintain a proper armored force. ...and days later, they deliver. 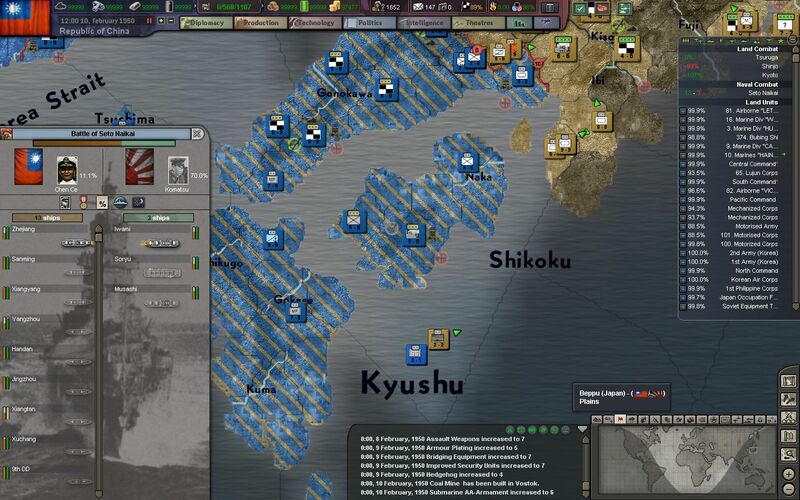 Osaka is taken after a brief skirmish with unsuspecting command units. 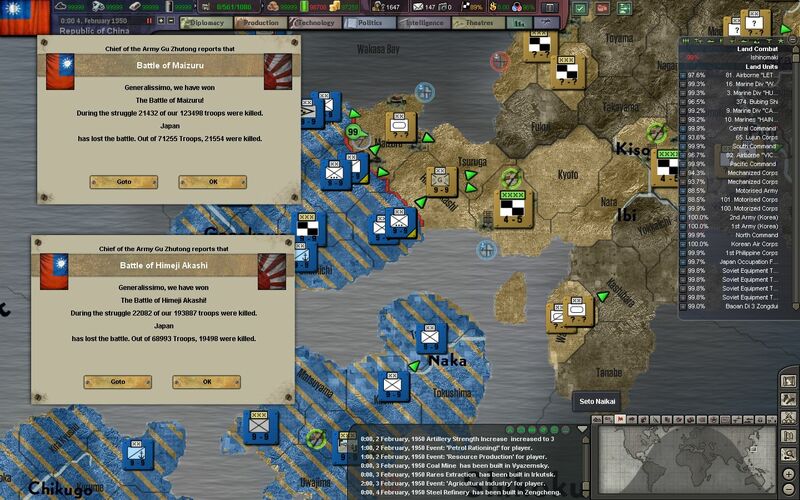 The Japanese fleet sallies out for a last hurrah against the battlecruiser ROCN Zhenjiang, and the rest of the 2nd Fleet. 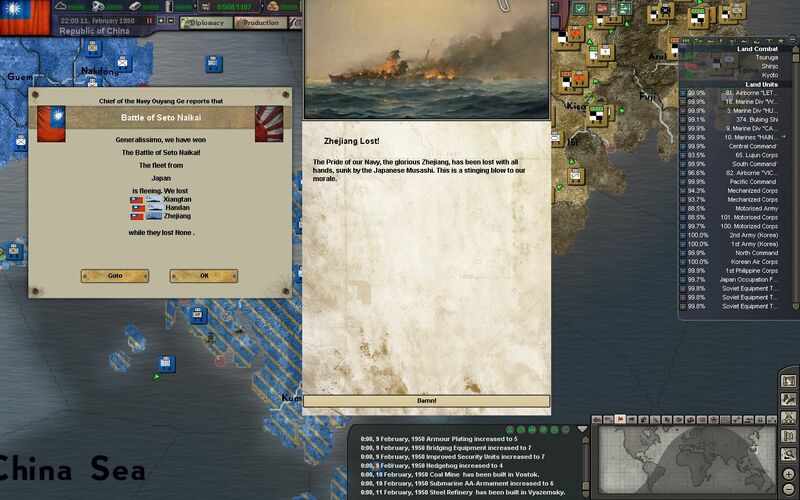 The battleships IJN Iwami and IJN Musashi deal a severe blow on the 2nd Fleet, sinking the ROCN Zhenjiang and two other light cruisers. The carrier IJN Soryu is taken out quickly after by CAGs operating in the area, and the two battleships retreat back to port. 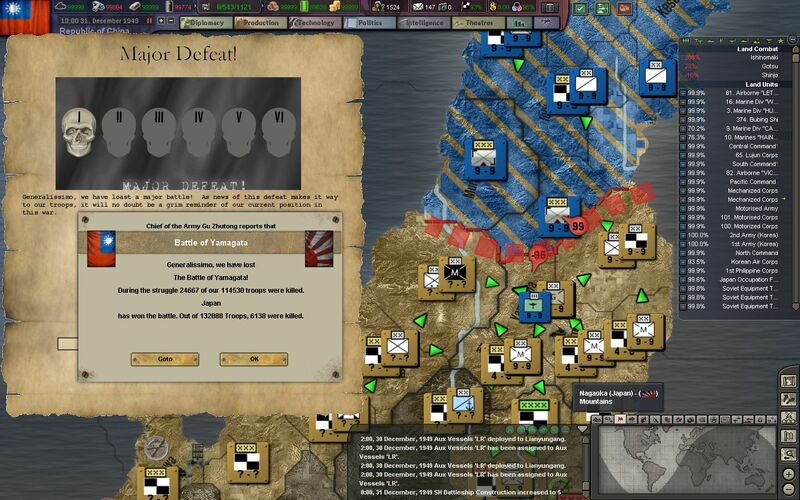 The mountains of Nara are seized, and threaten to cut off the remainder of the armored army stationed across from Shikoku. The major city of Nagoya will now also be close to capture. 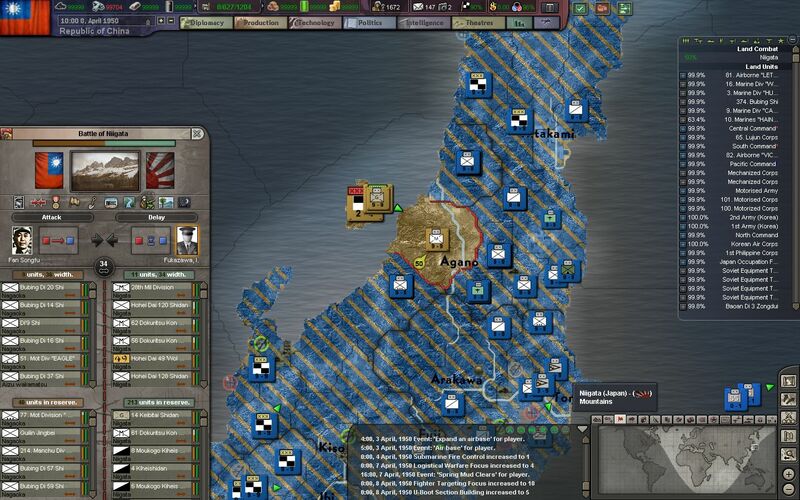 We must hold Nara if we hope to break out of our hold on western Honshu. 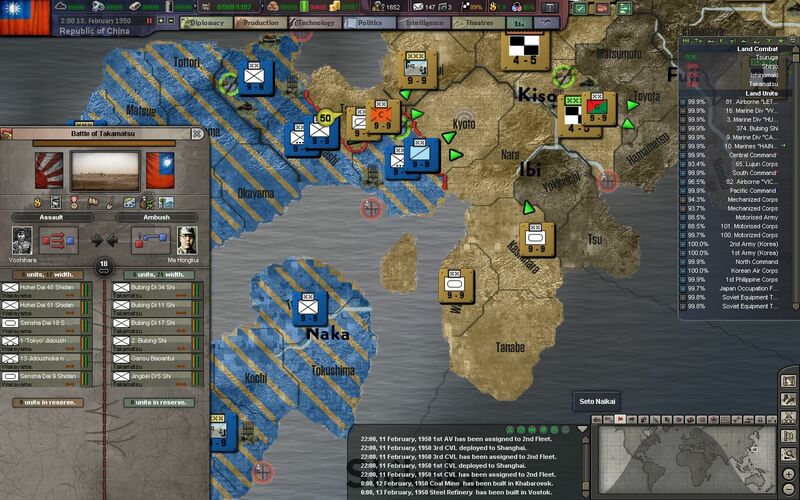 The panicked Japanese armored army now attempts to break out of their imminent encirclement, by rushing across the strait into Shikoku. Luckily we already have a dug-in garrison waiting to repel this breakout attempt. 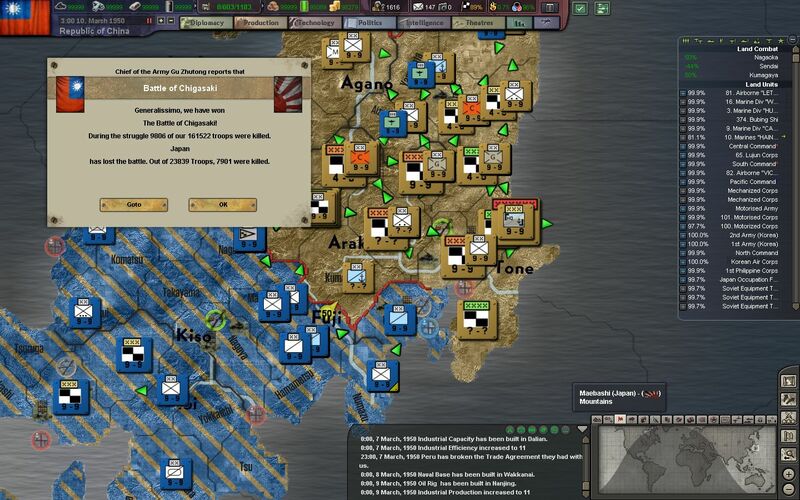 The ancient Japanese capital of Kyoto is taken by our motorized troops, and now the front in western Honshu has almost tripled in size. 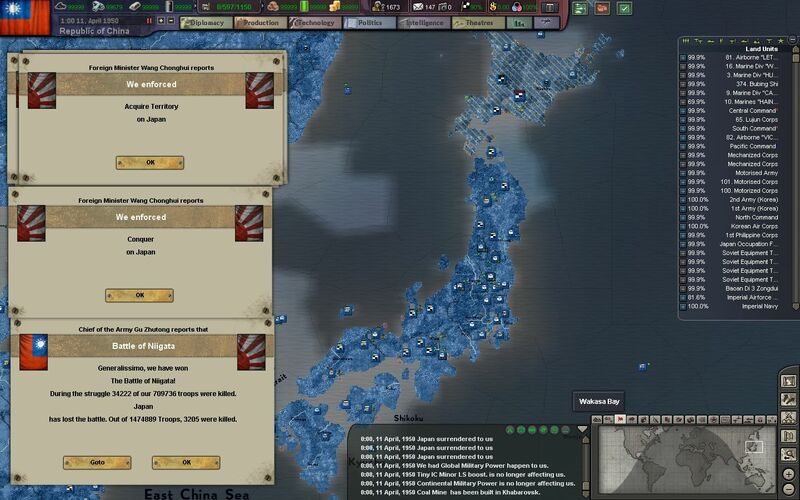 Finally our numerical superiority can be brought to bear on the Japanese. 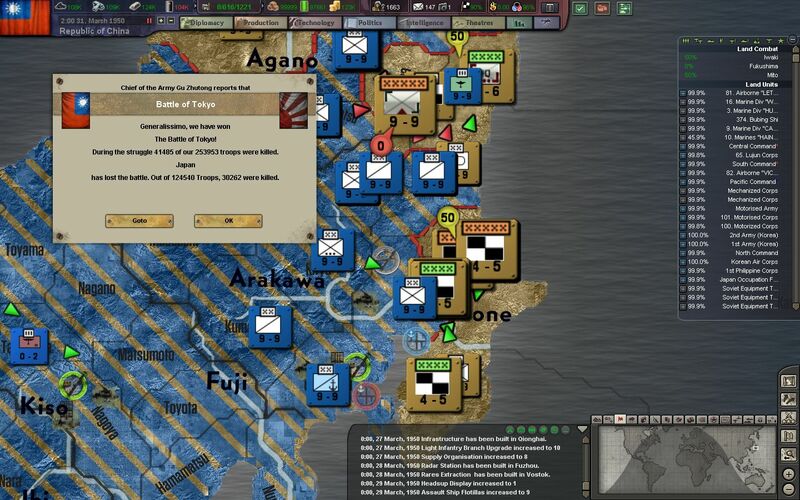 Our troops deftly crush the remnants of the Japanese armored army at Wakayama. 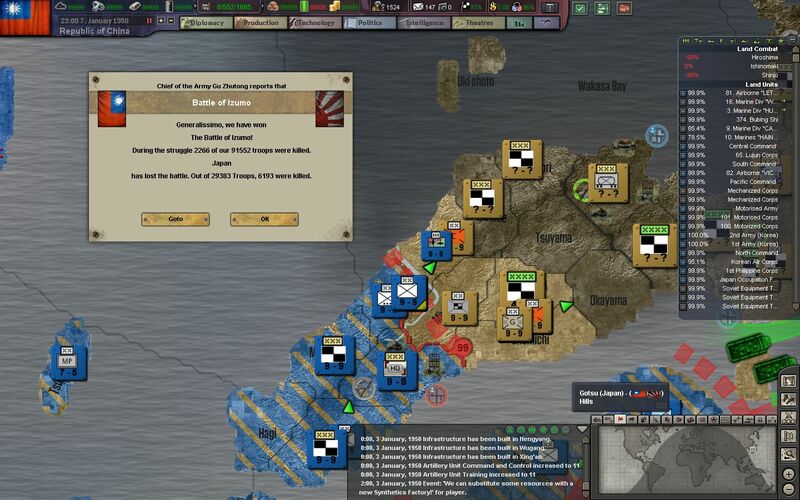 An all-out brawl has erupted in southern Honshu, but Japanese troops are spreading thin, and their divisions are commonly found to be at less than a half, or even a third of their nominal strength. Desertions and surrenders are becoming more and more common in this hellish environment. The city of Nagoya falls in the last days of February, but our troops are given no time to rest. In the advance on Tokyo, every hour matters. We are now less than 100 km from Tokyo. 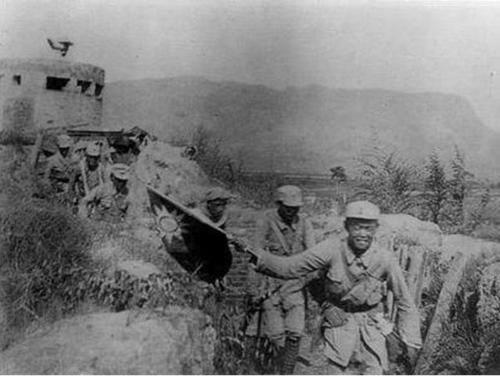 Much of the fighting is taking place in the north and center, where the mountain ranges of central Honshu have slowed the advance of our troops. 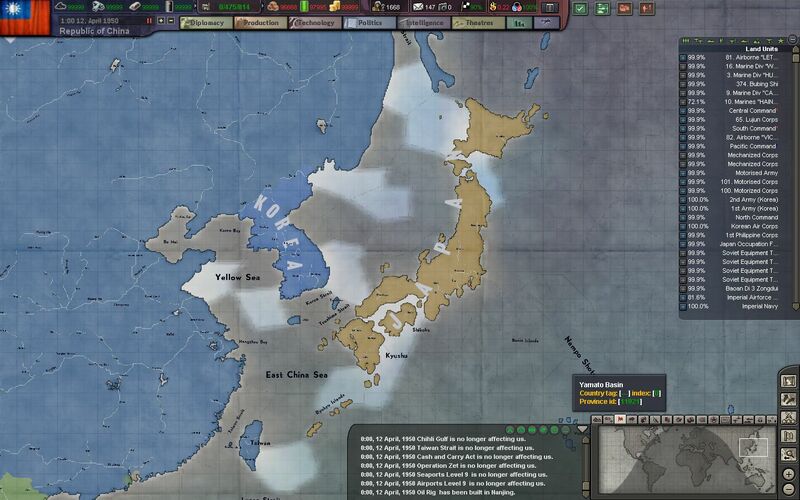 The Koreans in the north, always eager to join in on the fight, launch a massive assault - meant to dislodge the Japanese defenses around Tokyo and throw them into disarray. 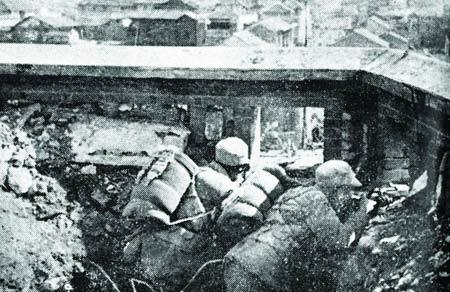 Inspired by the bravery of the Koreans, our mountain troops seize the mountains of Yamagata, that they have failed to capture for months now. 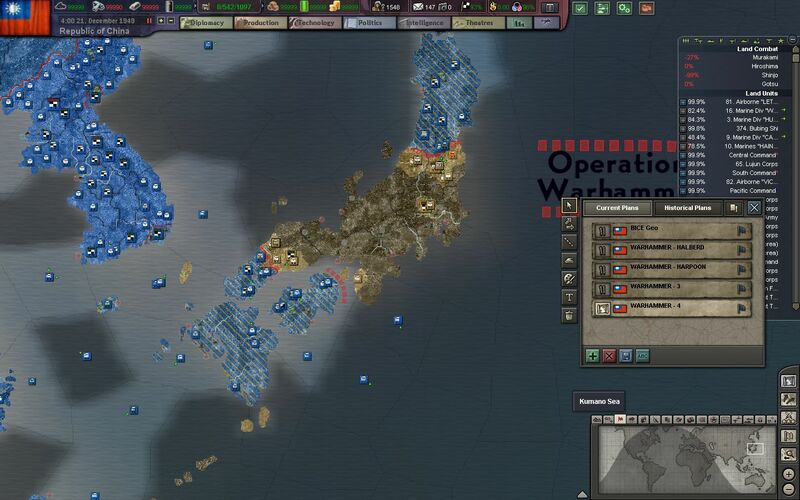 The southern suburbs of Chigasaki are captured by our marines, and now we are knocking down the door at Tokyo. 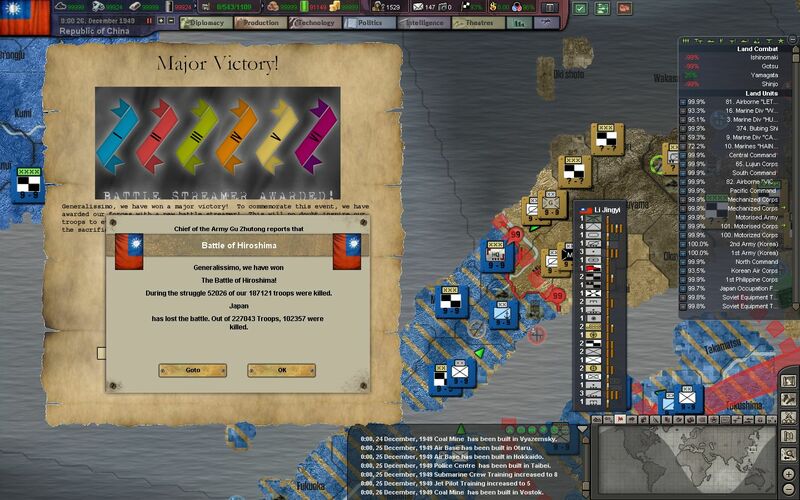 Victory is near, but a fierce battle awaits us at their capital. The marines and motorized divisions begin the assault on Tokyo, while our Shock Divisions are brought in from the rear to finish the fight. 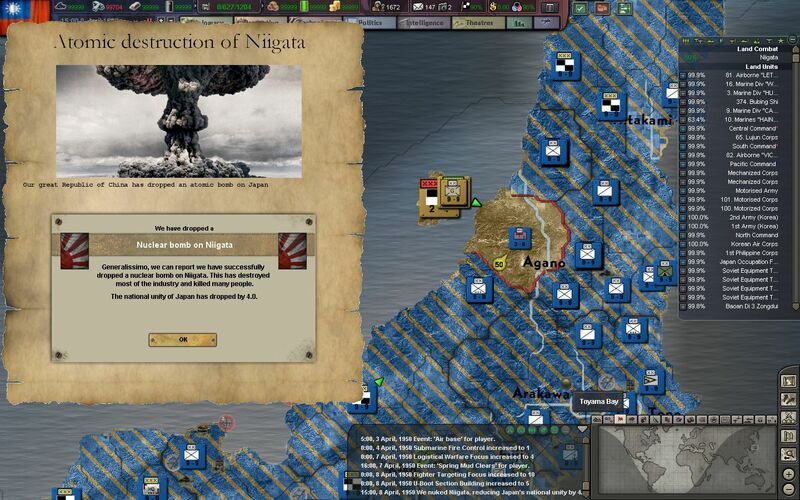 At Niigata we discover a massive camp of over 500,000 militiamen - who have refused the Emperor's orders to defend the capital Tokyo. 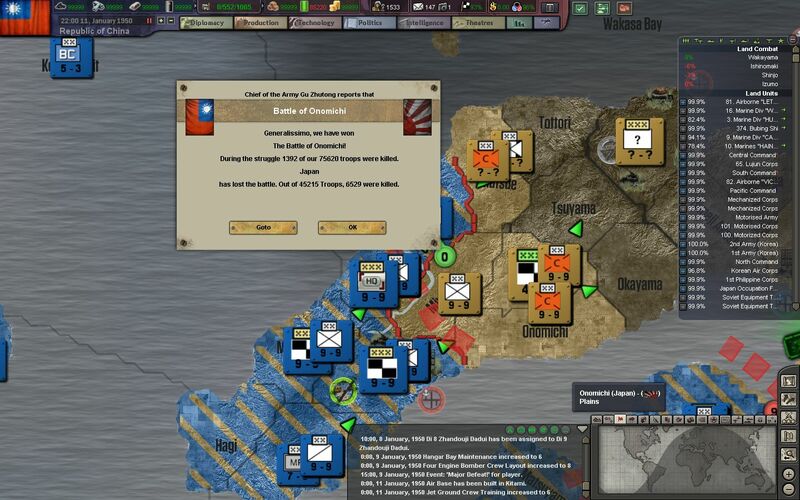 Our troops are ordered to leave these holdouts alone, until we destroy the rest of the IJA. 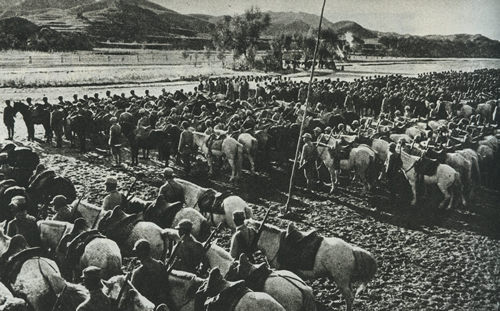 The mountains of Aizu Wakamatsu are taken shortly after, and the rebellious militiamen are now contained by our troops. 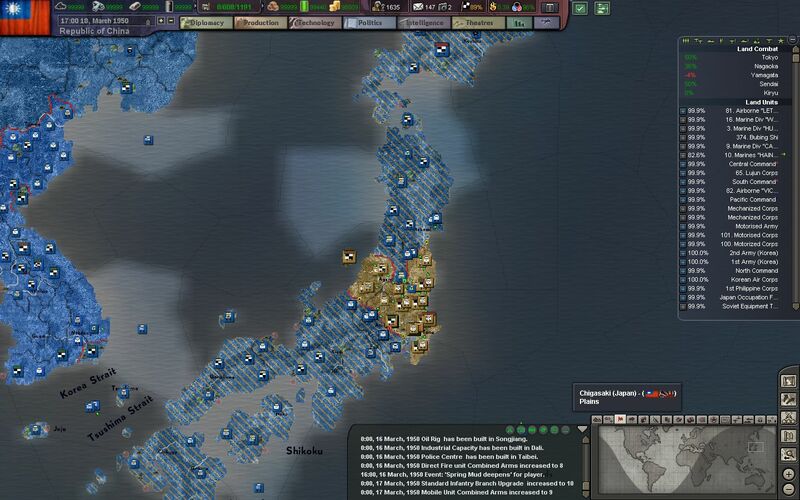 The Koreans storm in from the north, and create another pocket north of Tokyo. 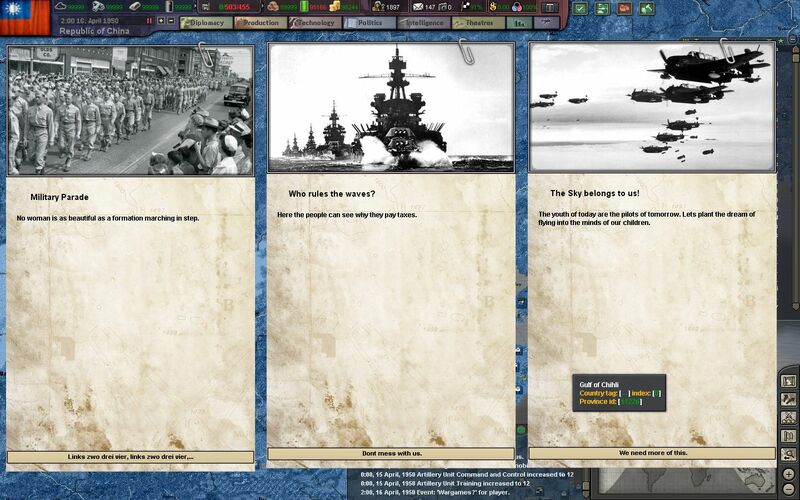 Tokyo falls after just two weeks of fighting, but the siege has left nearly 100,000 troops, and countless civilians dead. 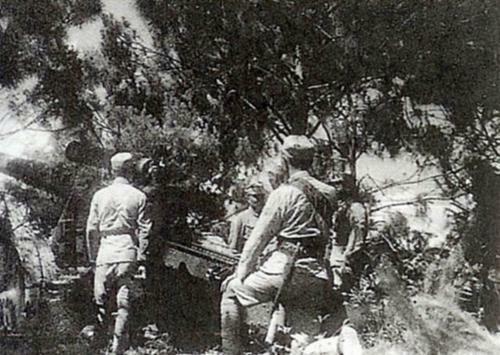 The last remaining pockets of the IJA are being cut down by our troops. Another nuclear bomb is enough to convince the militiamen to stand down. 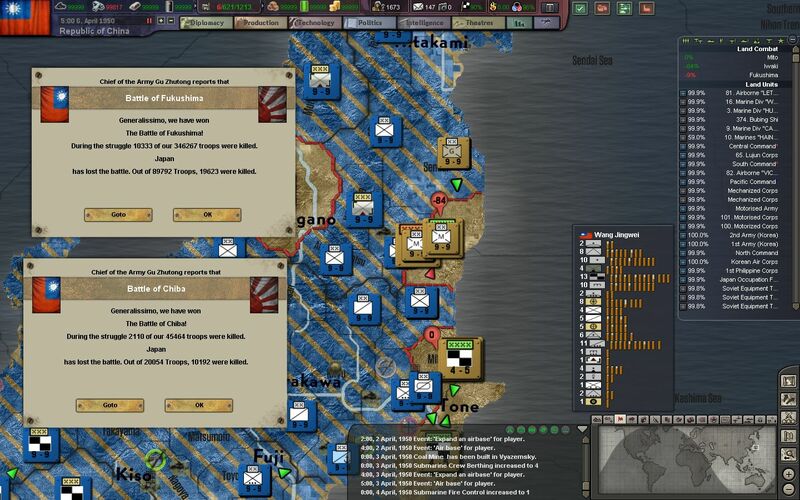 With the surrender of the militia at Niigata, the Japanese government formally surrenders to China and Generalissimo Chiang. 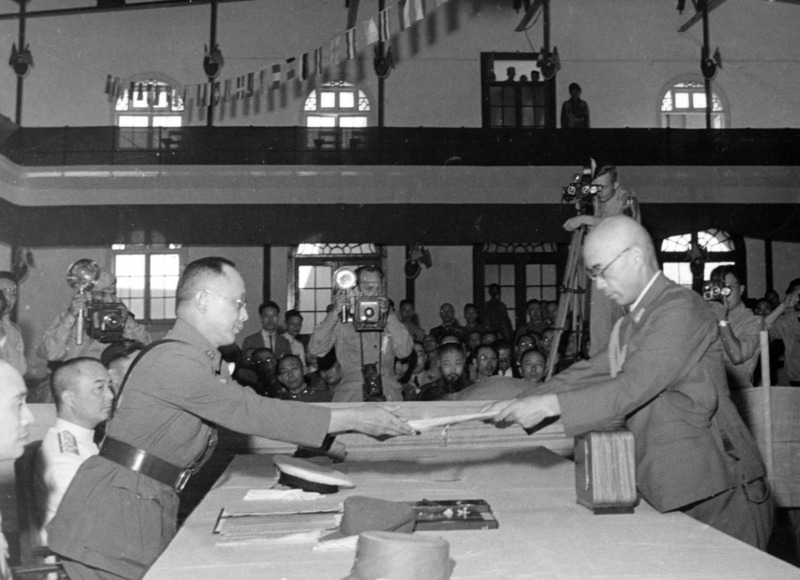 The final terms are signed at Tokyo, where most of the former Japanese government was interned after the city's capture. 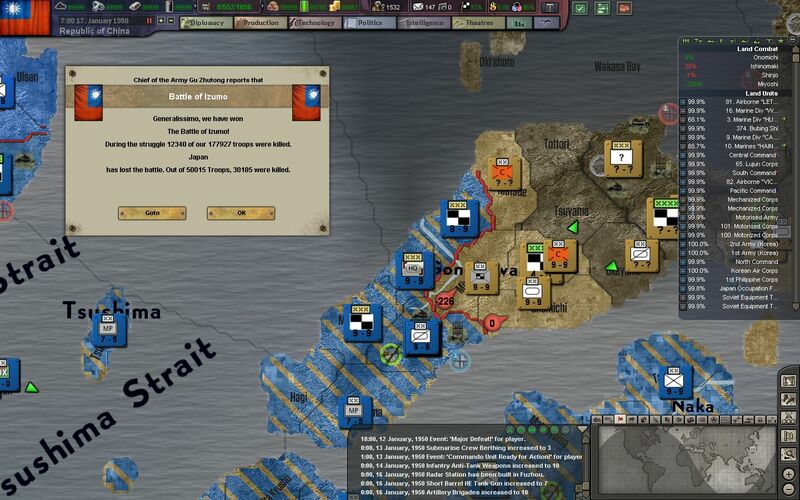 A loyal government is installed under the auspices of Chiang and the Kuomintang, and a temporary military occupation of the home islands for a period of 20 years is drawn up. Supplies are ferried across the East China Sea for the millions in Japan who have been living under austerity for the past 10 years - in a bid to build a better relationship with the country in the future. 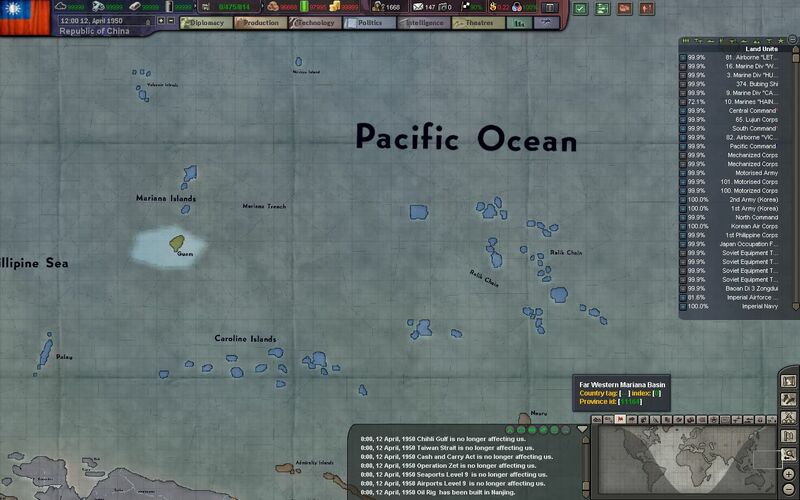 The Japanese pacific islands are now transferred to the Republic of China, much to the dismay of the Germans who initially held the islands before the first World War. 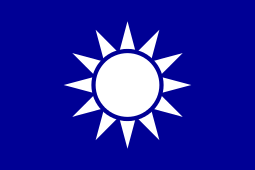 The Kuomintang relaxes its control of the government, but still maintains a hardline stance against any form of communism. Government factories are allowed to release some of their production to the market, and the press is given much more freedom. 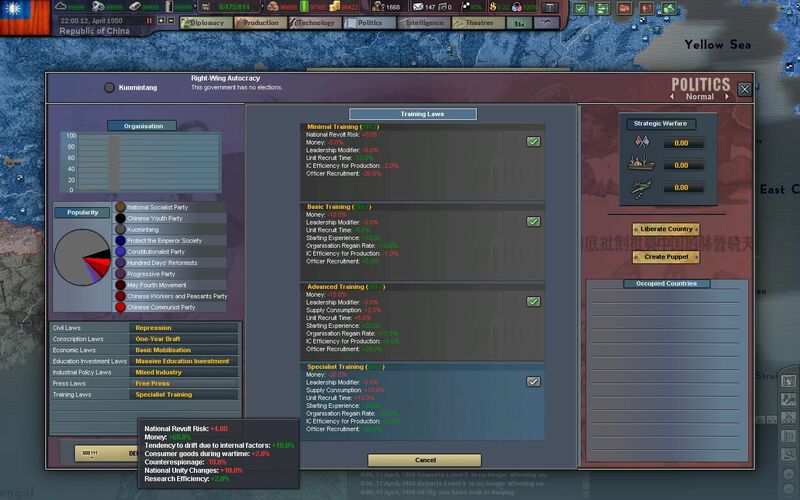 Former wartime concessions made to the Republic are returned to their rightful owners. 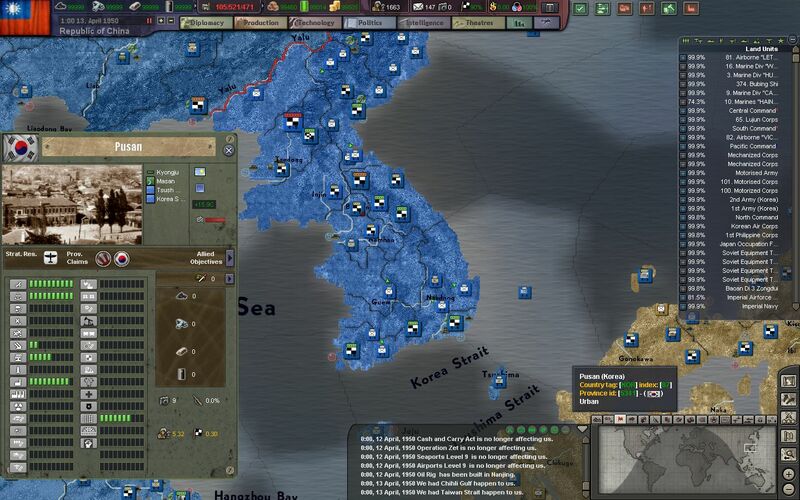 Pusan and Hamhung to Korea, Ilolio to the Philippines, and Hue City to Indochina. 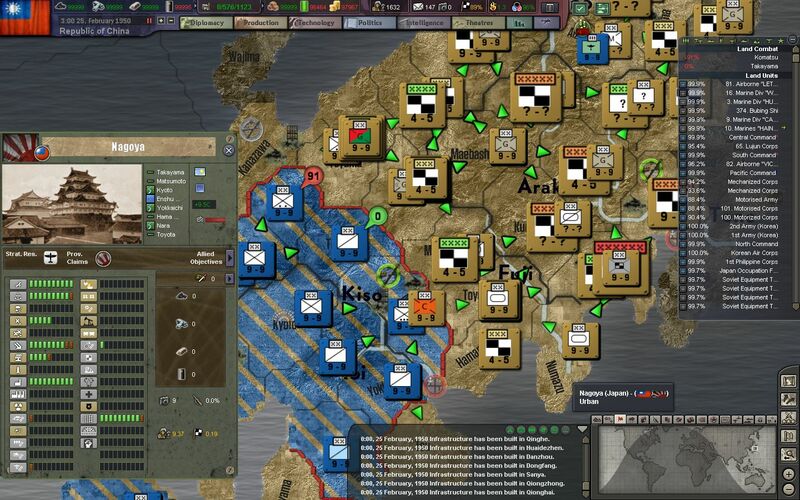 Millions in the reserves are sent home, as our divisions revert back to peacetime strength levels. There is a lot of rebuilding to do, and we need the men to do it. 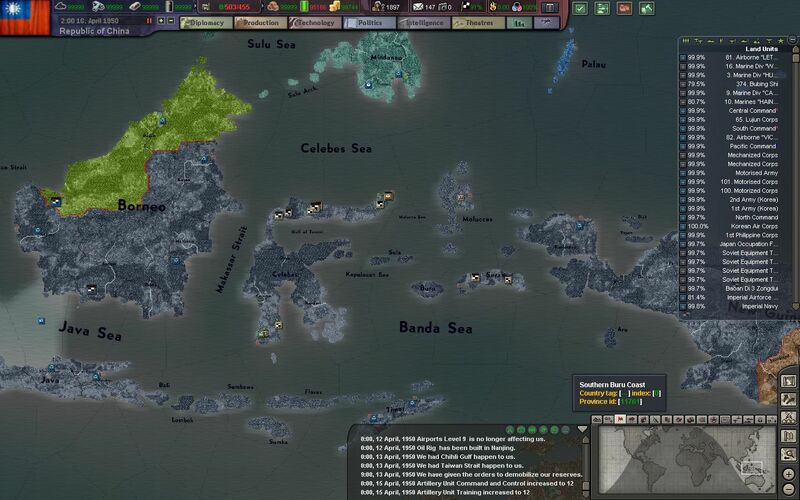 A rather forceful diplomatic push finally pushes the Brits over the edge, to cede the Celebes and Moluccas back to an independent Indonesia. 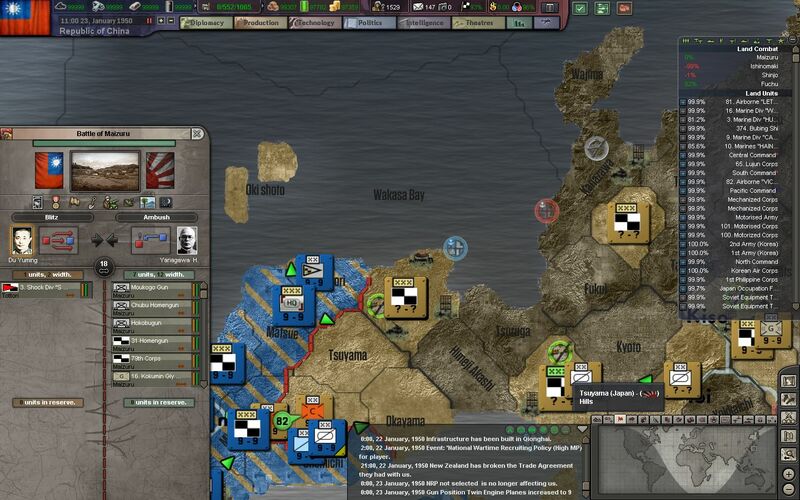 The United Kingdom reassures the public that this is a decision to focus all of its efforts to containing the growing German Empire in Europe. 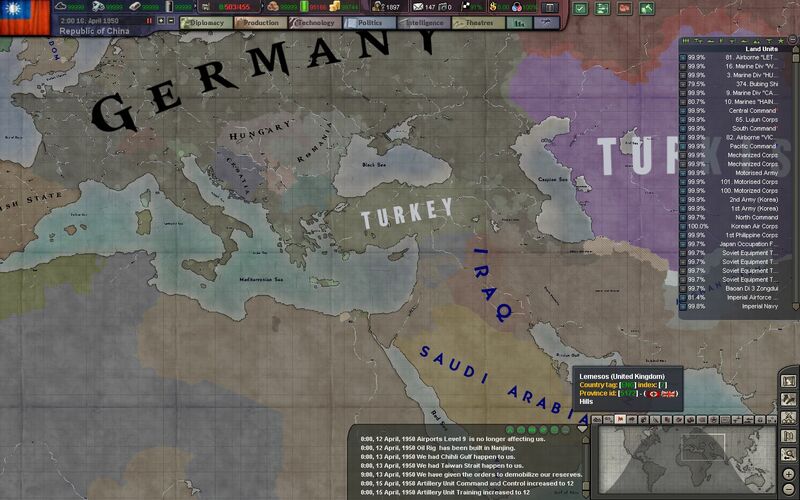 The Reich turns away from Fortress Britain and down towards the Middle East, where it campaigns in northern Iran and Iraq - hoping to dislodge their oil industries there and prompt a revolution against the UK in India. 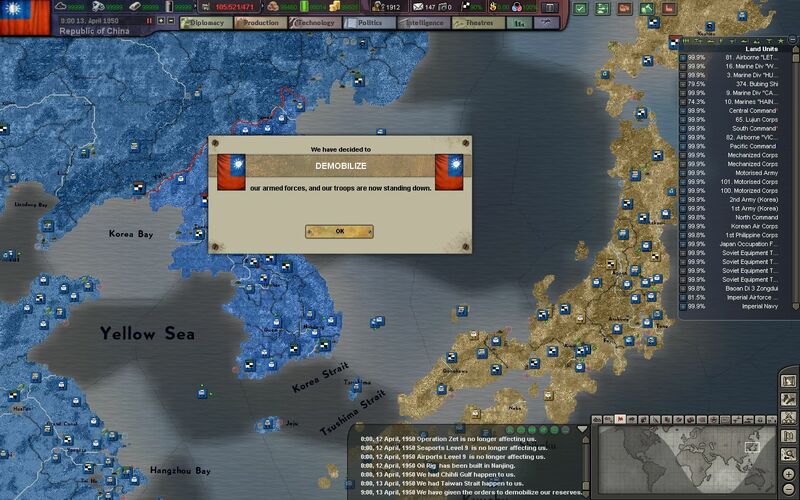 Generalissimo Chiang assures Hitler, Churchill, and China that he and his allies are not eager to rush into yet another war. Parades are held all over the country for our victorious troops headed home. Millions of men served in the NRA, and millions were lost to the enemy as well. Their sacrifice will never be forgotten, nor will it be for naught. 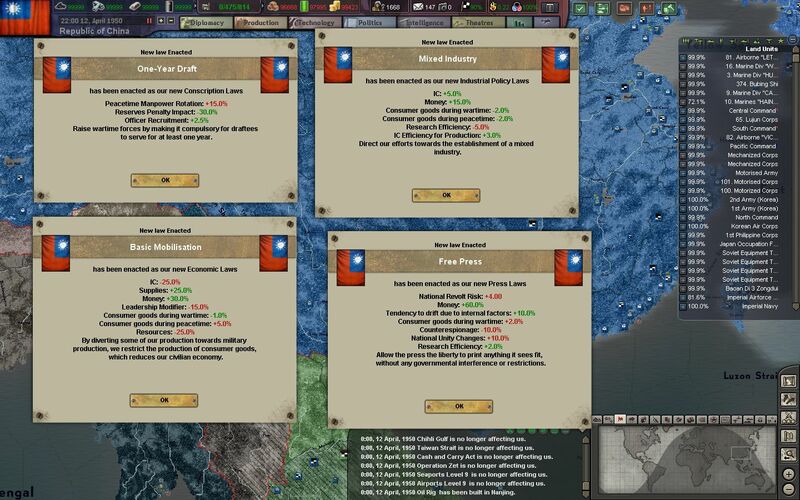 China and the Pacific is now the greatest alliance of powers in the world. Thanks for reading, especially if you have been following this AAR all the way through. If you want to catch up on the previous episodes, please refer to the list on the first image of this album.